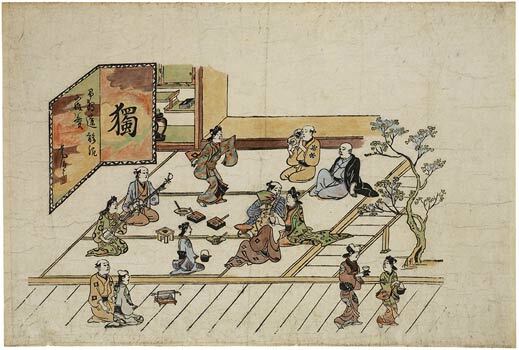 From the 12-print-series "Scenes from Yoshiwara" The fukinuki-yatai ("blown-off roof") style provides a bird’s eye view of the inside of a dwelling: after the long way out from Edo, three visitors to the Yoshiwara district have reached their desired destination and are being treated to music and dance, along with food, drink and tobacco, by the "team" of the establishment. Originally this series of prints was arranged as a hand scroll. In a leaf like this one, the strong relation of early ukiyo-e to contemporary paintings of the Tosa School, which were more sophisticated and traditional, as well as to the yamato-e of the past, is clearly evident. The way in which Moronobu presents the inside of the teahouse for view by doing away with the roof, looking from a right viewpoint down into the scene, is a stylistic medium known in traditional painting as kukinuki yatai (the blown-awy roof). With no obstacle present, one can look into the ample room, complete with veranda. Nothing seems to disturb the pleasure and amusement of the scene. The three enthusiasts of Yoshiwara after a long and tiresome journey, presented on the preceding leaves. They have nearly reached the aim of all their desire. a shelf with books and a little black table are hidden. Although the costumes show the fashion of the time, the composition of the scene seems to be related much more to traditional representations of an interior scene rather than to contemporary portrayals.